A dish that transcends various cultures. For a more informal gathering, place everything on the table and allow diners to create their own spring rolls. 1 To make the Wrappers, whisk the eggs into the oil. Then add the cornstarch and salt, and whisk until well dissolved. Add the water to form a smooth batter. 2 Ladle about 3 tablespoons of the batter onto a heated skillet and tilt the skillet so the batter forms a thin, even layer. Cook for 1 minute, then flip the Wrapper over and cook on the other side for another minute. Set the Wrapper aside. Repeat to make 14 more Wrappers or until the batter is used up. 3 To make the Filling, heat the oil in a saucepan and stir-fry the garlic until golden brown, then add the onion and stir-fry until translucent. Add the heart of palm or bamboo shoots and cook over medium heat until tender, about 5 minutes. Add the shrimp and pork, and cook until the shrimp turn pink. Add the green beans and simmer for 3 minutes. Season with the salt and pepper and mix well. Remove from the heat and set aside. 4 Combine all the Sauce ingredients, except the peanuts, in a deep saucepan or wok over high heat. Stir constantly until the sauce thickens, about 3 minutes. Remove from the heat and set aside to cool. 5 Lay a Wrapper on a flat surface. Place a lettuce leaf on the Wrapper, so that part of the leaf extends beyond the edge of the Wrapper. Place 3 tablespoons of the Filling at the edge of the Wrapper, then fold one end in and roll it up. 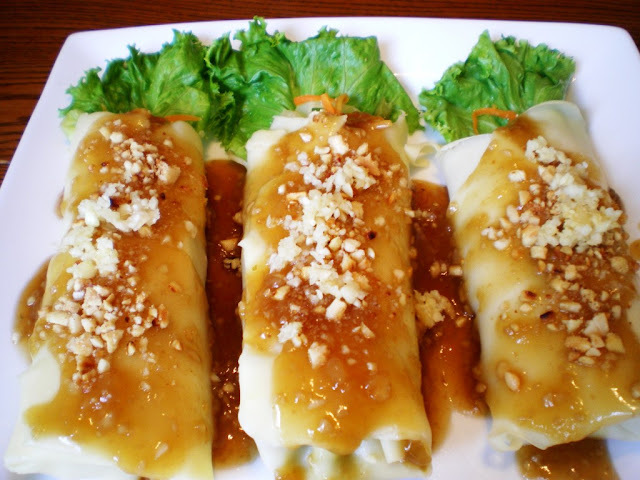 6 Drizzle the Sauce over the spring rolls and sprinkle with the peanuts.